What $500K gets you in housing across U.S.
Each week, TODAY's Barbara Corcoran looks around the U.S. to see what homebuyers can get for their money. This week’s search goes from Portland, Maine to Portland, Oregon, in search of truly unique properties you can get the keys to for $500,000 or less. Six bedrooms, three full baths and two partial baths. Portland is Maine’s biggest city, a vibrant, diverse community with a busy port. This huge 1905 Greek revival home has 14 rooms, 6 bedrooms, 5 baths, 6000 square foot of living space and a deck that runs clear around the house! There are built-in bookcases and a wood-burning fireplace in the living room. The entryway has marble floors and a wood-capped staircase. The formal dining room has a wood-burning fireplace, big windows and enough importance to seat Thomas Jefferson! The master bedroom has beautiful wood floors and a wood-burning fireplace. 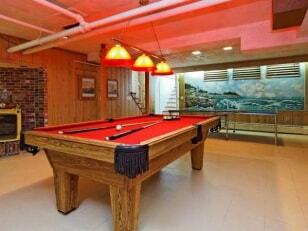 The pool room has its own kitchen and fireplace. The kitchen is surprisingly sleek and updated with an oversized eating area. Here’s a 1905 Greek Revival home big enough to have your whole neighborhood move in! Click here to see the listing (new window). It’s hard for 1 home to be “quaint” and “modern” but this beautiful home is! It’s on Lady Bird Lake, named for Austinite Lady Bird Johnson. It has an 8-foot tall frosted glass door. The home is nestled among nine large cedar elms — they not only look good, they smell great! The backyard has a redwood deck and drought-tolerant plants, perfect for Austin’s hot summers. The modern eat-in kitchen has wood cabinets, granite counters and a plate glass backsplash. Upstairs there are solid white oak floors. The master bedroom has a luxurious marble and glass bathroom. There’s a private loft with open treetop and lake views. The living room has 10-foot barrel vaulted ceilings and polished concrete floors. Franklin is 14 miles south of Nashville. 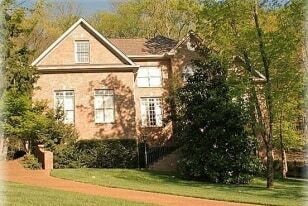 This 3600 square foot elegant brick home has three living areas and a three-car garage! 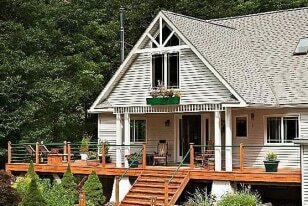 It’s surrounded by mature trees and the deck runs almost the entire length of the house! 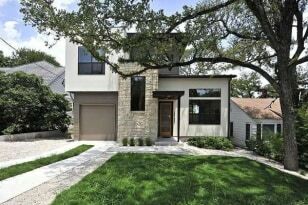 There are hardwood floors throughout and two custom fireplaces. The sweeping staircase has an iron balustrade and oak handrail. The family room has treyed ceilings, a chair rail and floor-to-ceiling windows. The living room has an elaborate custom fireplace and arched windows. The new kitchen has maple cabs, a big separate pantry, hutch and an adjacent “gathering room” with fireplace and breakfast area. The downstairs master bedroom has French doors onto the backyard deck. Property taxes are just $2,929. Take a look at how much house you can get for only $250 a month in taxes! Fishkill is a perfect New York City getaway less than 80 miles from the city! Taxes on this house are only $500 a month! The craftsman-style home is on 10 quiet acres in the Hudson River Valley. It’s at the end of a long paved driveway and there are stone walls, acres of walking trails, a brook — you can even have horses. 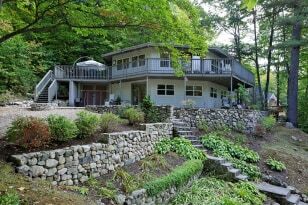 It has a 1,200 square foot wraparound cedar deck. The kitchen is a knockout with new granite counters and a window overlooking the grounds. The open floor plan offers lots of comfort and no wasted space. I love the cozy, knotty pine reading nook upstairs. There’s even a Finnish sauna on the deck. Portland is a sophisticated city with a thriving job market. This split-level 4 bedroom home is surrounded by trees, parks and walking trails and is just minutes from downtown. The backyard reads like a mini park of your own! The open floor plan has over 3,100 square feet! 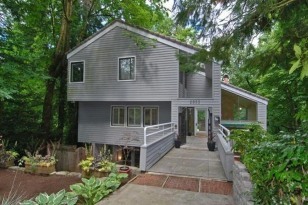 There are vaulted ceilings, wood floors and plenty of windows overlooking the dense greenery. The living room has a wall of double-height windows, a fireplace and slider doors leading to an oversized patio. The clean, open kitchen has stainless steel appliances. There are wood floors throughout the first floor. Each bedroom is like its own loft high up in the treetops!